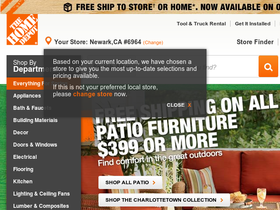 Home Depot, online at HomeDepot.com, is the home improvement superstore. With everything you could possibly need for a do-it-yourself home makeover, your home is sure to be everything you imagine. Home Depot’s departments include appliances, bath, building materials, décor, doors & windows, electrical, flooring, kitchen, lighting & fans, lumber & composites, outdoors, paint, plumbing, storage & organization, and tools & hardware. With Home Depot’s endless selection of household and home maintenance products, this store lives up to its motto, “You can do it. We can help.” Start your next home improvement project at Home Depot, and be sure to check out RetailSteal.com for all the best Home Depot savings, Home Depot discounts, and Home Depot deals. Standard shipping from Home Depot takes 3-5 days for delivery, and expedited, express, cost saver, and home delivery shipping are all available also. Processing time and shipping rates vary based on the product(s) you order. See website for details and more information. Save up to 60% on overstock items at Home Depot. Click link to shop. Act now and enjoy a 10% discount on your appliance purchase of $397 or more. At Home Depot, save up to $750 on home appliances when you shop online. Click link for savings. Shop patio furniture at Home Depot and save up to 60% on your purchase. Spend $45 or more and get free shipping on most items when you shop online at Home Depot. Click link for savings. Visit Home Depot to receive up to a 70% discount on select lighting. Shop online at Home Depot and save $75-$250 on bath products. Home Depot offers completely free appliance delivery and haul away with no exclusions. Shop at Kmart and enjoy 30% savings on select outdoor toys. Click here to shop. Shop Kmart.com and save big on exciting merchandise with the Blue Light deal of the day. Click link to start saving now. Shop at Kmart and enjoy $5 savings on orders $45+. Click here for code. Shop at Kmart and enjoy 10% savings on jewelry. Click here for code.